The Earth Has Oceans And Continents: How Weird Is That? : 13.7: Cosmos And Culture We have both continents and oceans on Earth — but it didn't have to be this way. And on most planets, it probably isn't, says astrophysicist Adam Frank. 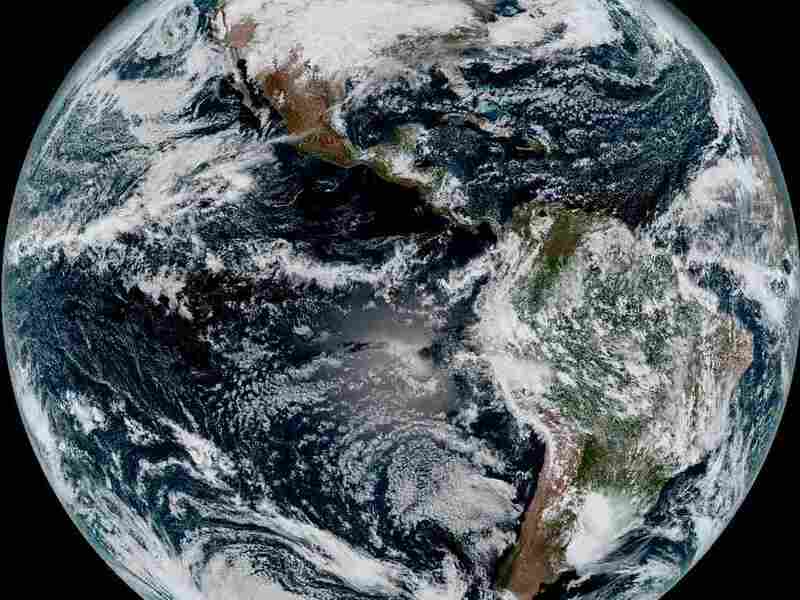 The Earth Has Oceans And Continents: How Weird Is That? Seen from space, our planet has often been called a "blue marble." It's not, however, just the swirly white clouds that give Earth its marbled appearance. The continents: They are what complete the metaphor. All that land, sticking up above sea level, gives our world its distinctive look. But now that we know the universe is awash in planets, just how distinct is our world? Is an almost equal mix of land and sea common — or will most planets be either entirely desert or entirely ocean? Most importantly, how does the dry-land vs. open-water mix influence the evolution of intelligent life? The relationship between land, water and the presence of intelligent observers (like us) is the topic of a provocative paper by Fergus Simpson, a researcher at the University of Barcelona. One of the best things about Simpson's study is it reminds us of a simple fact about life on Earth: You can't take any of it for granted. Here is the thing: It is kind of weird that we live on a planet that has almost equal amounts of open ocean and dry land. Every planet will have some degree of bumps on its surface — highland and lowlands. The more water the planet has, the more the lowlands get filled in. But if a planet doesn't have much in the way of a water inventory, that world should be quasi-desert with nothing more than a bunch of disconnected lakes. This is exactly what is seen on Titan, the giant moon of Saturn, which is the only other solar system body that shows liquid on its surface (of course Titan is so distant and cold that the lakes are actually made of liquid methane at minus 292 degrees Fahrenheit). But with enough water, sea levels will be above the highest point on the planet. In that case, what you have is an ocean world (astronomers prefer the term water-world, sorry Kevin Costner). Getting the mix that Earth has, however, seems tricky. If our planet had just three times more water than it does now, even Mt. Everest would be submerged. So somehow we got just enough water to form globe-spanning oceans, while also retaining enough highlands to form large-scale continents (it's worth noting that the Earth may not have had continents early on, they may have had to grow). So how do planets get their water? The water mostly comes from comets and asteroid impacts early in the planets' history. Recent studies imply that the amount of water delivered during planet formation should be random. That means there should be a lot more ways to end up with water-world planets or desert-world planets than the remarkable fine-tuned balance we have on Earth. That fact alone is enough to give one pause. More than anything, it shows you the real power of science as a force in human culture. We tend to just think the ways things are, well, they're just the way things are. We don't usually go to the beach, stare at the ocean and think: "Wow, that's really weird." But science gives us new eyes. It lets us see that even the map of the world is full of mystery. Continents and oceans, we have them both. But it didn't have to be this way. And on most planets, it probably isn't. Next time you look at the stars, pick one and focus on it. It almost definitely has planets basking in its warmth. Can you see, in your mind's eye, if it's a water-world wrapped in endless blue oceans? Or might it be a desert-world of sand and dunes stretching to every horizon? And, here, I leave you with a question: Is there any process naturally regulating the evolution of water on a planet that could make our balance of oceans and land natural? Or did we just get lucky? If the answer is luck, is there a connection between the happy water-land mix Earth has and our own evolution as intelligent observers? Is that why we are here? Are we truly children of both water and land?